You know, I really try. I really do. Being one of those Pinterest mom’s is just not in the cards for me.You know the whole post about cookies I just did? It came out ok, and it was all true – for the most part. I wanted my own Stars Hollow, and I got it. But what bothers me now is that I was wholly honest with you the reader. 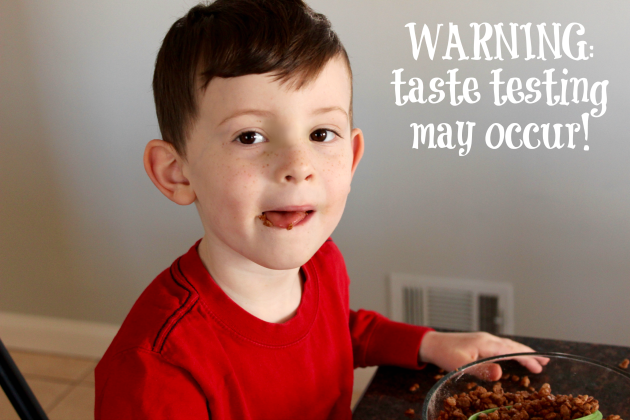 Did I attempt making the cookies with my son? Sure. What you didn’t see, however, is that it was a total disaster and that I will never make cookies with him until he’s at least….oh, I’d say…eighteen. During the baking process for my last cookie post, my kitchen was a mess, flour was everywhere, sugar ended up in places I’d rather not mention on the internet, my son had very little patience in mixing all the ingredients, he ATE all the frosting instead of spreading it on the cookies, and he was more interested in playing with the raw dough as opposed to cutting it into cute little shapes and baking them. An activity that really shouldn’t have taken more than an hour lasted for over four hours. Yes, you read that right, four hours. Despite my promise, I hid that from you. I wanted it to look good. I wanted to be a Pinterest mom for once in my life. But give me credit, I’m coming clean now. Although I may not be a Pinterest mom, I will tell you that I’m a least a resourceful mom. So, instead of cookies, I made the best use out what I had in the cupboard. But first, let me say this – I am not putting Pinterest moms down here. The fact that you can take a pumpkin, put your kid in it, photograph it, and make it look cute and not like your baby was a enormous bubble bursting from the headless horseman’s noggin is nothing short of a miracle. Seriously, all the power to you. This is more and indictment of my abilities than anything else. Do I want the adorable picture of my kids holding christmas lights wearing santa outfits on white backgrounds for my christmas cards? Of course. Instead, I’ll have to opt for the generic white card that simply says “Merry Christmas!” because Pinterest and I just don’t get along. It is my honest-to-god belief that I inspired those breathtakingly funny “NAILED IT” photos you see splattered over the inter-webs of people who tried to Pinterest and just failed miserably. That said, in spite of my cookie failure, I did rock out some serious Neapolitan Rice Krisipies Treats with my son and it was actually a lot of fun. I’ve never actually made them with him, and to be honest, I think this desert choice is much more his speed. 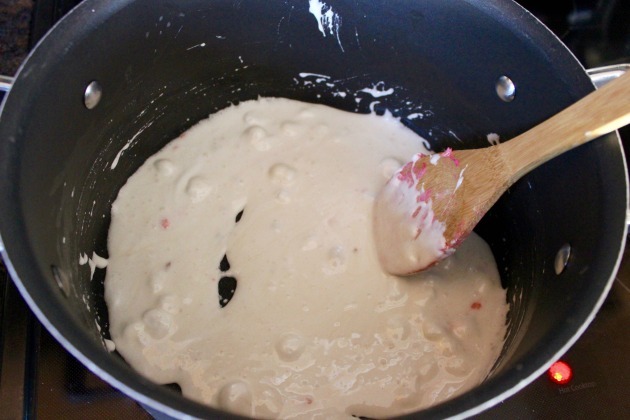 You get some butter, melt some marshmallow, throw in a bunch of cereal, mix it all up and then spread it out. Done. 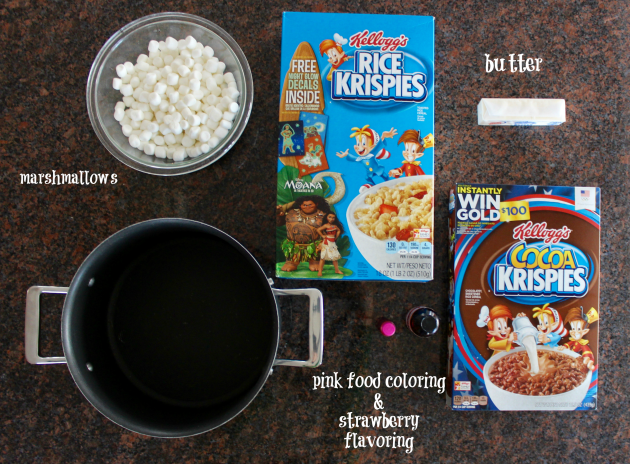 I used 2.5 cups of mini marshmallows and 1.5 tbs of butter for each layer of the Neopolian Rice Krispies Treat! 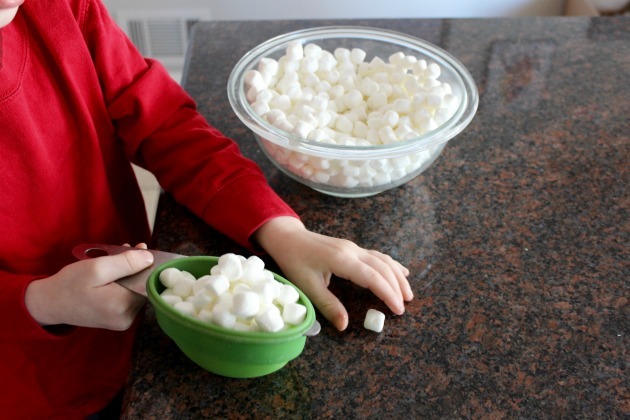 First we measured out the marshmallows. Melted them with the butter on medium heat until they became a sticky soup. 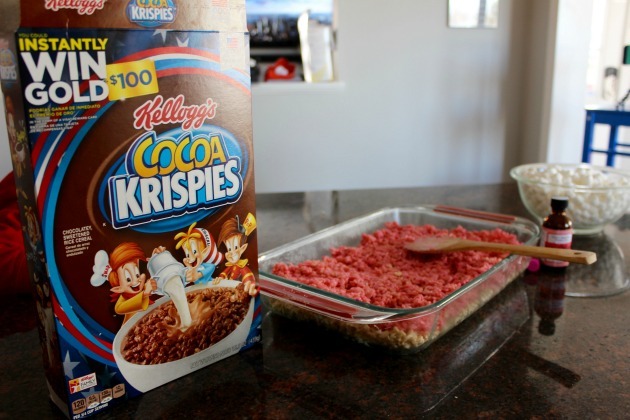 Added 2.5 cups of Rice Krispies, and patted them down in a sprayed casserole pan. 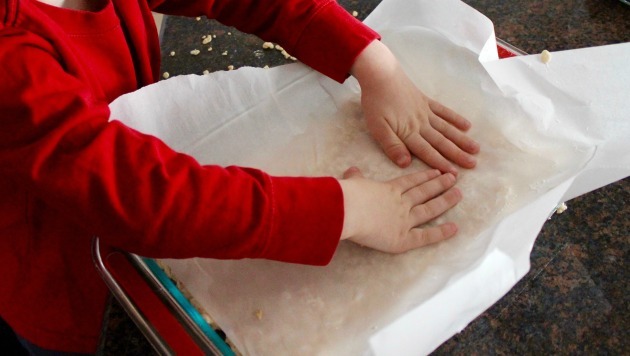 We used parchment paper to keep the mixture from sticking to our hands. For the strawberry layer, I added a few drops of pink food coloring and a half tsp. 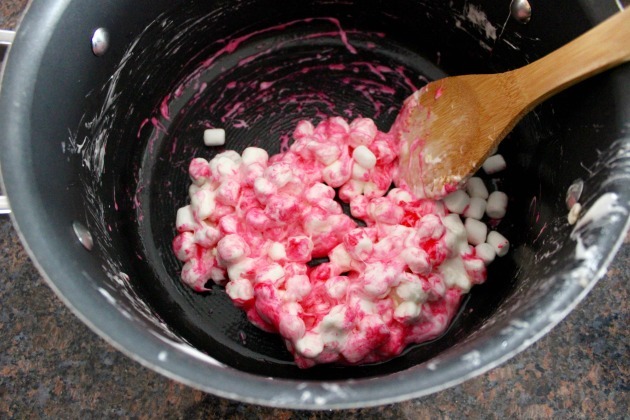 of strawberry flavoring to the marshmallows and butter. 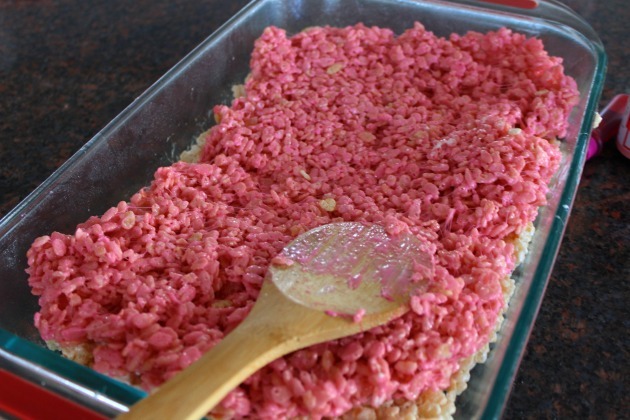 After mixing in the Rice Krispies, our strawberry layer was ready to be added and pat down! 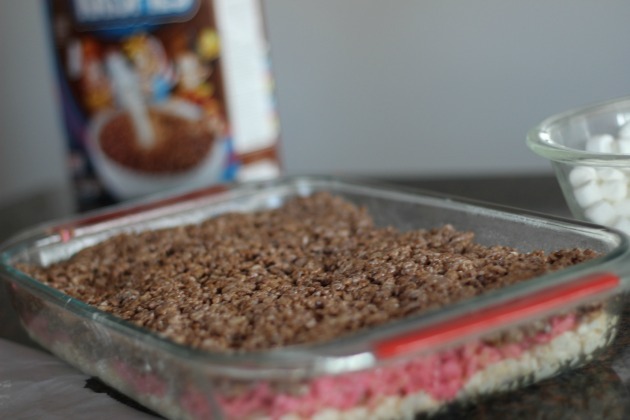 Last it was time for the chocolate layer – made with Cocoa Krispies! Then we let the mixture cool. After cooling, cut into thin bars. We also made some of the holiday red and green colored Rice Krispies – and made them into stars! 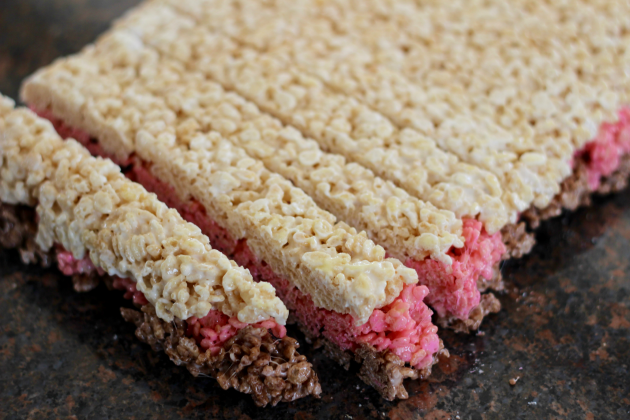 Using cookie cutters on Rice Krispie Treats is easier with a thinner treat. Did he almost sneak a big bite out of the stick of butter on me? Yes! The kid’s a freaking ninja. I don’t know how he does it. 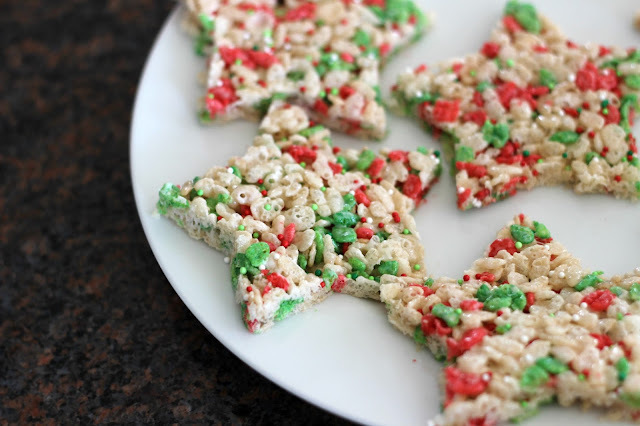 But, despite all that – we had fun making them while listening to the Michael Buble christmas station on Pandora and I even got a little creative and made star shaped Rice Krispies Treats too. I may not be a Pinterest mom, but I’m definitely a creative one. That, and I just love deserts. Because it’s a relatively simple recipe, and there aren’t these fine measurements upon which the very quality the product solely relies, it doesn’t really matter how much or how little one ingredient goes in or not. We just had fun mixing, torturing each other with the faucet while we tried to wash our hands of all the melted marshmallow, and it was honestly a completely stress free environment. 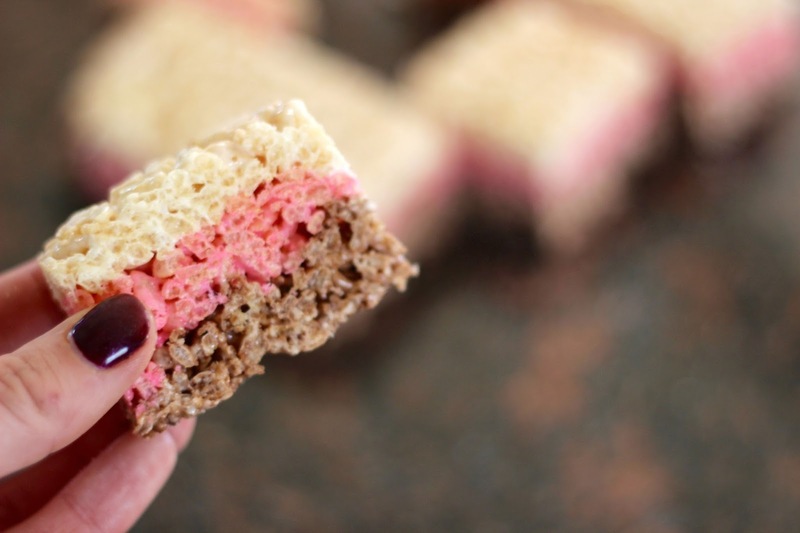 So, in my opinion, if you need time to kill, and you don’t want the stress of trying to make these beautiful cookies, just make Neapolitan Rice Krispies Treats. They’re easier, a lot more fun, and very kid friendly. 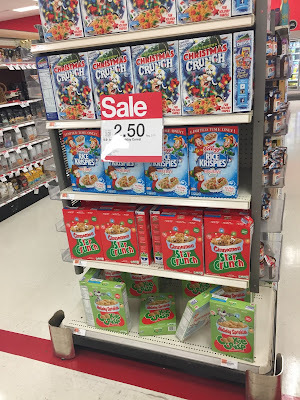 Now, if I could only find the Rice Krispies Treats equivalent to christmas cards. Is there a Pinterest mom out there for hire? -Cool facts: The limited edition holiday colored Rice Krispies (red & green) is now available for purchase! -Rice Krispies will donate a toy to Toys-For-Tots for every treat shared on social media by you the readers! 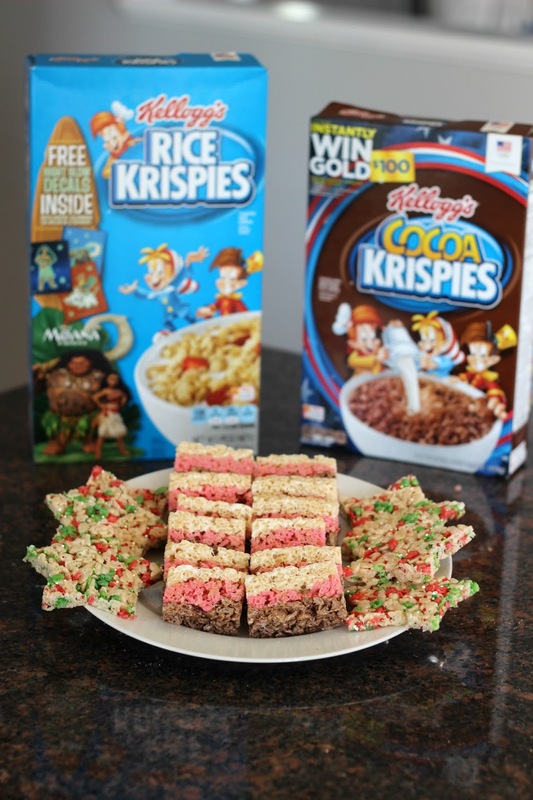 So make a treat, share a photo of your treat using #Treats4Toys, and Rice Krispies will donate a toy to a child in need! This offer is good from September 26th-January 1st. 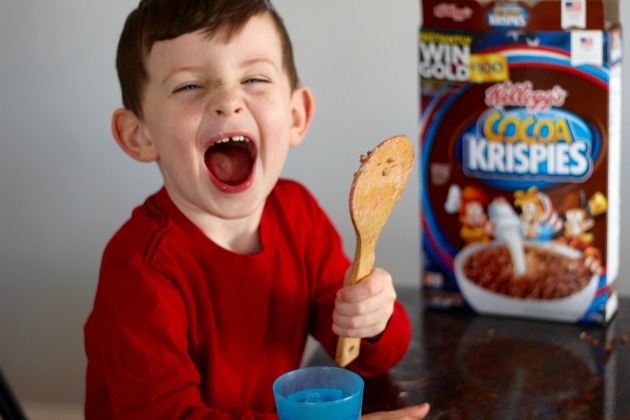 Here’s a really cool recipe below – and if you click this link, you can get even more Rice Krispies inspiration! 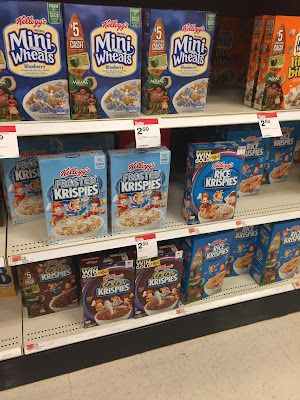 I purchased my Rice Krispies at Target – and the holiday one was even on the end! 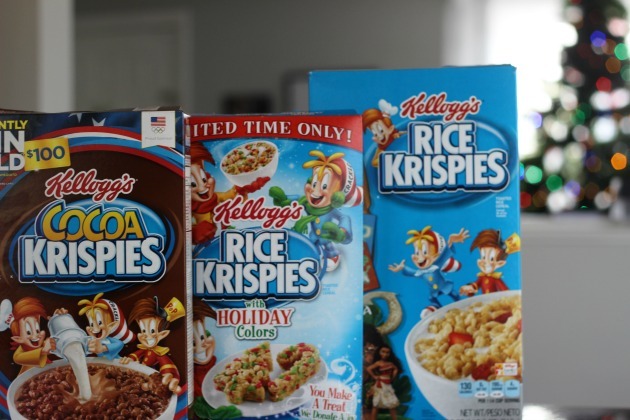 And Rice Krispies has their own PINTEREST page! So you can check it out and get inspiration for days!